สถานการณ์คล้ายกันนี้ยังได้เกิดขึ้นในอิตาลี แม้ว่าอิตาลีจะเป็นพันธมิตรฝ่ายไตรภาคีและได้รับดินแดนอยู่บ้าง แต่พวกชาตินิยมอิตาลีรู้สึกโกรธแค้นที่คำมั่นสัญญาของอังกฤษและฝรั่งเศสให้ไว้เพื่อให้อิตาลีเข้าสู่สงครามในสนธิสัญญาลอนดอน ไม่เป็นไปตามการตกลงสันติภาพ นับจาก ค.ศ. 1922 ถึง 1925 ขบวนการฟาสซิสต์ นำโดยเบนิโต มุสโสลินี ยึดอำนาจในอิตาลีด้วยวาระชาตินิยม เผด็จการเบ็ดเสร็จและความร่วมมือระหว่างชนชั้น ซึ่งยกเลิกระบอบประชาธิปไตยแบบมีผู้แทน สังคมนิยมใช้อำนาจบังคับ กำลังฝ่ายซ้ายและเสรีนิยม และดำเนินนโยบายต่างประเทศแบบก้าวร้าวโดยมีเป้าหมายเพื่อสถาปนาอิตาลีเป็นมหาอำนาจของโลกโดยใช้กำลัง คือ "จักรวรรดิโรมันใหม่"
↑ ตามที่ D.Glantz ได้กล่าวไว้ว่า, The Soviet‐German War 1941–45 "เมื่อถึงวันที่ 1 พฤศจิกายน [กองทัพบกเยอรมัน] ได้สูญเสียกำลังพลกว่า 20% ของกองกำลังดั้งเดิม (686,000 นาย) และกว่า 2/3 ของพาหนะยานยนต์ครึ่งล้านคัน 65% ของจำนวนรถถัง โดยกองบัญชาการทหารสูงสุดของเยอรมนีได้จัดกำลังพล 136 กองพลของตนให้เป็น 83 กองพลเต็มอัตราศึก"
↑ ตามการเขียนของ Ernest May (The United States, the Soviet Union and the Far Eastern War. The Pacific Historical Review. V. 24. No. 2. (1955) p.156) เชอร์ชิลล์ชี้ว่า: "การประกาศสงครามของรัสเซียต่อญีป่นจะเป็นการสร้างความได้เปรียบให้กับฝ่ายเราเป็นอย่างมาก โดยมีเงื่อนไขเท่านั้นว่า พวกรัสเซียจะต้องรู้สึกมั่นใจว่าแนวรบด้านตะวันตกของพวกเขาจะไม่เสียไป"
↑ ปฏิบัติการครั้งนี้ "เป็นความพ่ายแพ้อย่างฉิบหายที่สุดแห่งกองทัพเยอรมันทั้งหมดในสงครามโลกครั้งที่สอง", The operation "was the most calamitous defeat of all the German armed forces in World War II". 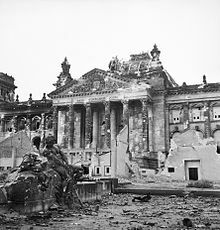 แหล่งที่มา: Zaloga, Bagration 1944: The destruction of Army Group Centre, 7. ↑ Keegan, John (1989), The Second World War, Glenfield, Auckland 10, New Zealand: Hutchinson . ↑ Sommerville, Donald (14 Dec 2008). The Complete Illustrated History of World War Two: An Authoritative Account of the Deadliest Conflict in Human History with Analysis of Decisive Encounters and Landmark Engagements. Lorenz Books. p. 5. ISBN 0-7548-1898-5. ↑ Hakim, Joy (1995). A History of Us: War, Peace and all that Jazz. New York: Oxford University Press. ISBN 0-19-509514-6. ↑ Kenneth, Brody, J (1999). The Avoidable War: Pierre Laval and the Politics of Reality, 1935–1936. Transaction Publishers. p. 4. ISBN 0765806223. ↑ Zalampas, Michael (January 10, 1989). Adolf Hitler and the Third Reich in American magazines, 1923-1939 (Google Books). Bowling Green University Popular Press. p. 62. ISBN 0879724625. สืบค้นเมื่อ 2009-11-14. ↑ Taylor, Jay (2009). The Generalissimo: Chiang Kai-shek and the struggle for modern China. Harvard University Press. pp. 150–152. ISBN 978-0-674-03338-2. ↑ Sella, Amnon (October 1983). "Khalkhin-Gol: The Forgotten War". Journal of Contemporary History 18 (4) : 651–87. ↑ "Pact of Steel", in Dear and Foot, ed., Oxford Companion to World War II, Oxford University Press, 2002, ISBN 0-19-860446-7, p. 674. ↑ Michael Jabara Carley (1993). End of the 'Low, Dishonest Decade': Failure of the Anglo-Franco-Soviet Alliance in 1939. Europe-Asia Studies 45 (2), 303-341. ↑ Rudolf Schlesinger. The Foreign Policy of Soviet Russia. Soviet Studies, Vol. 1, No. 2, (Oct., 1949) , pp. 140-150. พิมพ์ที่: Taylor & Francis, Ltd.
↑ E. H. Carr., From Munich to Moscow. I., Soviet Studies, Vol. 1, No. 1, (Jun., 1949), pp. 3-17. Published by: Taylor & Francis, Ltd.
↑ Tucker, Spencer; Roberts, Priscilla Mary. Encyclopedia of World War II: A Political, Social, and Military History, pg. 771; note, however, that Tucker's own view is that 191 is most convenient; p. 9. ↑ Roskill, S.W. (1954). The War at Sea 1939-1945 Volume 1 : The Defensive. History of the Second World War. United Kingdom Military Series. London: HMSO. p. 64. ↑ 68.0 68.1 Bilinsky, Yaroslav. Endgame in NATO's Enlargement: The Baltic States and Ukraine, Greenwood Publishing Group, 1999, ISBN 0-275-96363-2, p. 9. ↑ Deist, William, et al., Germany and the Second World War — Volume 2: Germany's Initial Conquests in Europe, Oxford University Press, 2001, 0198228880, p. 311. ↑ Bilinsky, Yaroslav (1999). Endgame in NATO's Enlargement: The Baltic States and Ukraine (Google books). Greenwood Publishing Group. p. 9. ISBN 0275963632. สืบค้นเมื่อ 15 November 2009. ↑ Hadley Cantril, America Faces the War: A Study in Public Opinion, The Public Opinion Quarterly 4:3 (Sept. 1940), p. 390. ↑ "Tripartite Pact", in Dear and Foot, ed., Oxford Companion to World War II, p. 877. ↑ Dennis Deletant, "Romania", in Dear and Foot, ed., Oxford Companion to World War II, pp. 745–46. ↑ "The London Blitz, 1940". Eyewitness to History. 2001. สืบค้นเมื่อ 2008-03-11. ↑ Amnon Sella. "Barbarossa": Surprise Attack and Communication. Journal of Contemporary History, Vol. 13, No. 3, (Jul., 1978), pp. 555-583. ↑ Kershaw, Ian. Fateful Choices, pp.66–69. ↑ Alan F. Wilt. Hitler's Late Summer Pause in 1941. Military Affairs, Vol. 45, No. 4 (Dec., 1981), pp.187-191. ↑ David M. Glantz The Soviet‐German War 1941–45Myths and Realities: A Survey Essay. ↑ Klaus Reinhardt ; Karl B. Keenan. Moscow-The Turning Point: The Failure of Hitler's Strategy in the Winter of 1941-42. Berg, 1992. ISBN 0-85496-695-1. P.227. ↑ A. S. Milward. The End of the Blitzkrieg. The Economic History Review, New Series, Vol. 16, No. 3 (1964), pp. 499-518. ↑ Louis Rotundo. The Creation of Soviet Reserves and the 1941 Campaign. Military Affairs, Vol. 50, No. 1 (Jan., 1986), pp. 21-28. ↑ Raymond L. Garthoff. The Soviet Manchurian Campaign, August 1945. Military Affairs, Vol. 33, No. 2 (Oct., 1969), p. 312. ↑ Weinberg, Gerhard L (2005). A World At Arms. Cambridge University Press. p. 248. ISBN 0521618266. ↑ Irvine H. Anderson, Jr. De Facto Embargo on Oil to Japan: A Bureaucratic Reflex. The Pacific Historical Review, Vol. 44, No. 2 (May, 1975), p. 201. ↑ Wohlstetter, Roberta (1962). 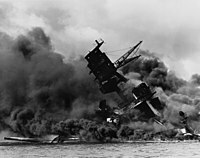 Pearl Harbor: Warning and Decision. Stanford University Press. pp. 341–43. ISBN 080470598 Check |isbn= value: length (help). ↑ Rees, Laurence (2009). World War Two Behind Closed Doors, BBC Books, p. 99. ↑ Rees, Laurence (2009). World War Two Behind Closed Doors, BBC Books, p. 406-7. ↑ Klam, Julie. The Rise of Japan and Pearl Harbor, Black Rabbit Books, 2002, p. 27. ↑ Lewis, Morton. "XXIX. Japanese Plans and American Defenses". In Greenfield, Kent Roberts. The Fall of the Philippines. U.S. Government Printing Office. p. 529. Library of Congress Catalogue Card Number: 53-63678. (Table 11). ↑ Perez, Louis G. (1 June 1998). The history of Japan (Google Books). Greenwood Publishing Group. p. 145. ISBN 0313302960. สืบค้นเมื่อ 2009-11-12. ↑ Davies, Norman (2006). Europe at War 1939–1945: No Simple Victory. Macmillan. p. 100. ISBN 0333692853. ↑ Robin Neillands. The Dieppe Raid: The Story of the Disastrous 1942 Expedition. (Indiana University Press, 2006). ↑ Kershaw, Ian. Hitler, 1936–1945: Nemesis, W. W. Norton & Company, 2001, ISBN 0-393-32252-1,p. 592. ↑ O'Reilly, Charles T. Forgotten Battles: Italy's War of Liberation, 1943–1945, p. 32. ↑ Bellamy, Chris T (2007). Absolute war: Soviet Russia in the Second World War. BAlfred A. Knopf. p. 595. ISBN 0-375-41086-4. ↑ Estonian State Commission on Examination of Policies of Repression (2005). The White Book: Losses inflicted on the Estonian nation by occupation regimes. 1940 – 1991 (PDF). Estonian Encyclopedia Publishers. ↑ Chubarov, Alexander. Russia's Bitter Path to Modernity: A History of the Soviet and Post-Soviet Eras, p. 122. ↑ "Market-Garden", in Dear and Foot, ed., Oxford Companion to World War II, Osprey Publishing, 1990, ISBN 0-85045-921-4,p. 877. ↑ Steven H. Newton (1995). Retreat from Leningrad : Army Group North, 1944/1945. Atglen, Philadelphia: Schiffer Books. ↑ Weinberg, Gerhard L. A World at Arms: A Global History of World War II, pp.758 & 820. ↑ Shepardson, Donald E (January 1998). "The Fall of Berlin and the Rise of a Myth". The Journal of Military History. 62 (1): 135–154. ↑ Glantz, David M. (1995). When Titans Clashed: How the Red Army Stopped Hitler. Lawrence, Kansas: University Press of Kansas. p. 34. ISBN 0700608990. ↑ Poirier, Michel Thomas (1999-10-20). "Results of the German and American Submarine Campaigns of World War II". U.S. Navy. สืบค้นเมื่อ 2008-04-13. ↑ Norbert Frei. Adenauer's Germany and the Nazi Past: The Politics of Amnesty and Integration. Translated by Joel Golb. New York: Columbia University Press. 2002. ISBN 0231118821, p, 41–66. ↑ Roberts, Geoffrey (2006). Stalin's Wars: From World War to Cold War, 1939–1953. Yale University Press. pp. 43. ISBN 0-300-11204-1. ↑ Wettig, Gerhard (2008). Stalin and the Cold War in Europe. Rowman & Littlefield. pp. 20–21. ISBN 0-7425-5542-9. ↑ Roberts, Geoffrey (2006). Stalin's Wars: From World War to Cold War, 1939–1953. Yale University Press. pp. 55. ISBN 0-300-11204-1. ↑ Grenville, John Ashley Soames (2005). A History of the World from the 20th to the 21st Century. Routledge. pp. 370–71. ISBN 0-415-28954-8. ↑ Wettig, Gerhard (2008). Stalin and the Cold War in Europe. Rowman & Littlefield. pp. 96–100. ISBN 0-7425-5542-9. ↑ Stokesbury, James L (1990). A Short History of the Korean War. New York: Harper Perennial. ISBN 0-688-09513-5. ↑ Oberdorfer, Don (2001). The Two Koreas: A Contemporary History. Basic Books. pp. 10–11. ISBN 0465051626. ↑ No, Kum-Sok; Osterholm, J. Roger (1996). A MiG-15 to Freedom: Memoir of the Wartime North Korean Defector who First Delivered the Secret Fighter Jet to the Americans in 1953. McFarland. ISBN 0786402105. ↑ Bull, Martin J.; Newell, James. Italian Politics: Adjustment Under Duress, Polity, 2005, ISBN 0-7456-1299-7, p. 20. ↑ 292.0 292.1 Harper, Damian. China, Lonely Planet, 2007, ISBN 1-74059-915-2, page 51. ↑ Kunkel, John. America's Trade Policy Towards Japan: Demanding Results, Routledge, 2003, ISBN 0-415-29832-6, p. 33. ↑ "World War II: Combatants and Casualties (1937 — 1945)". สืบค้นเมื่อ 2007-04-20. ↑ "Source List and Detailed Death Tolls for the Twentieth Century Hemoclysm". สืบค้นเมื่อ 2007-04-20. 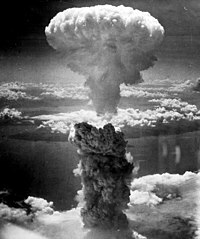 ↑ "World War II Fatalities". สืบค้นเมื่อ 2007-04-20. ↑ "Leaders mourn Soviet wartime dead". ↑ Florida Center for Instructional Technology (2005). "Victims". A Teacher's Guide to the Holocaust. University of South Florida. . Retrieved 2008-02-02. ↑ J. M. Winter, "Demography of the War", in Dear and Foot, ed., Oxford Companion to World War, p 290. ↑ Hornberger, Jacob (1995),Repatriation—The Dark Side of World War II, The Future of Freedom Foundation. ↑ Koh, David (21 August 2008). "Vietnam needs to remember famine of 1945". The Straits Times (Singapore). สืบค้นเมื่อ 25 January 2010. ↑ Harding, Luke (22 October 2003). "Germany's forgotten victims". The Guardian. UK: Guardian News and Media. สืบค้นเมื่อ 21 January 2010. ↑ "Final Compensation Pending for Former Nazi Forced Laborers". ↑ "Gulag: Understanding the Magnitude of What Happened". ↑ "Soviet Prisoners of War: Forgotten Nazi Victims of World War II". ↑ Richard Overy The Dictators: Hitler's Germany, Stalin's Russia pp. 568–69. ↑ "The warlords: Joseph Stalin". ↑ "Japanese Atrocities in the Philippines". ↑ Yuki Tanaka, Hidden Horrors, 1996, p.2,3. ↑ S. P. MacKenzie "The Treatment of Prisoners of War in World War II" The Journal of Modern History, Vol. 66, No. 3. (Sep., 1994), pp. 487-520. ↑ Zhifen Ju, "Japan's atrocities of conscripting and abusing north China draftees after the outbreak of the Pacific war", 2002, (DOCID+id0029) Library of Congress, 1992, "Indonesia: World War II and the Struggle For Independence, 1942–50; The Japanese Occupation, 1942–45"
↑ Milward, Alan S. War, Economy, and Society, 1939–1945, p. 148. ↑ Tucker, Spencer; Roberts, Priscilla Mary. Encyclopedia of World War II: A Political, Social, and Military History, p. 76. ↑ Levine, Alan J. The Strategic Bombing of Germany, 1940–1945, p. 217. ↑ Sauvain, Philip. Key Themes of the Twentieth Century: Teacher's Guide, p. 128. ↑ Sumner, Ian; Baker, Alix. The Royal Navy 1939–45, p. 25. 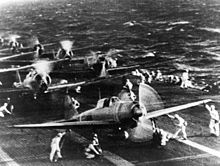 ↑ Hearn, Chester G. Carriers in Combat: The Air War at Sea, p. 14. ↑ Gardiner, Robert; Brown, David K. The Eclipse of the Big Gun: The Warship 1906–1945, p. 52. ↑ Burcher, Roy; Rydill, Louis. Concepts in Submarine Design, p. 15. ↑ Burcher, Roy; Rydill, Louis. Concepts in Submarine Design, p. 16. ↑ 358.0 358.1 Tucker, Spencer; Roberts, Priscilla Mary. Encyclopedia of World War II: A Political, Social, and Military History, p. 125. ↑ Dupuy, Trevor Nevitt. The Evolution of Weapons and Warfare, p. 231. ↑ 360.0 360.1 Tucker, Spencer; Roberts, Priscilla Mary. Encyclopedia of World War II: A Political, Social, and Military History, p. 108. ↑ Tucker, Spencer; Roberts, Priscilla Mary. Encyclopedia of World War II: A Political, Social, and Military History, p. 734. ↑ 364.0 364.1 Schoenherr, Steven (2007). "Code Breaking in World War II". History Department at the University of San Diego. Archived from the original on 9 May 2008. สืบค้นเมื่อ 15 November 2009. หน้านี้แก้ไขล่าสุดเมื่อวันที่ 18 เมษายน 2562 เวลา 01:09 น.